On 13th January, there was a skirmish of Chhatra Dal with Shibir over the admission process. 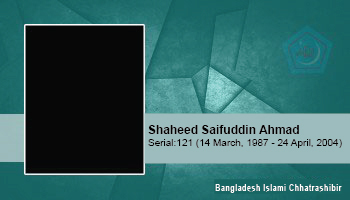 The next day, Chhatra Dal terrorists attacked 1st year student Saifuddin Ahmed at the Kajla gate business area with rods and sharp weapons. He had gone there to do some photocopying of notes. Nobody came to his help since he was in religious attire and the police were doing nothing but standing and watching. After being left for dead by his attackers, he was taken to Rajshahi Medical College Hospital. He survived, and regained consciousness after two months in intensive care at the military hospital in Dhaka, after which he was transferred to Heart and Touch Hospital, where he breathed his last.